"Red Globes" is an oil painting on canvas, 30" x 30". The background is black and white striped fabric. 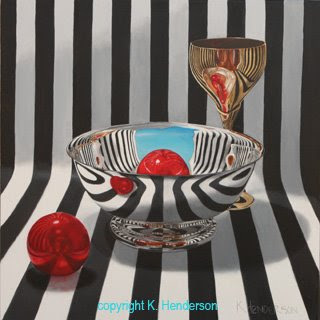 The silver bowl and the brass goblet show the striped reflections. There are two red globes which are also reflected in the silver and brass. Yippee!! 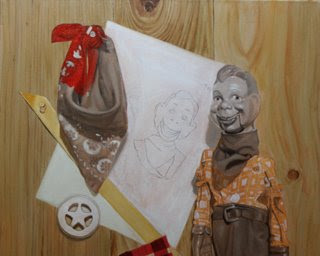 I got a painting excepted into the Oil Painters Of America Natioanl exhibit. There are over 2,400 entries in this show and only 200 are accepted! I entered my painting 'Jack in the Box' . The image above is a detail. The exhibit this year will be in Santa Fe with the opening on May 1. I'll have more details later. 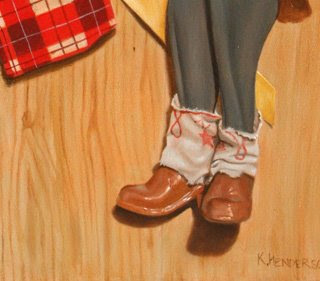 And here’s a part of the painting that I haven’t been showing. You can see the differnet textures in the pants, the boots and the wood. RED! I love the color red. I continued glazing the red scarf and the yellow ribbon. 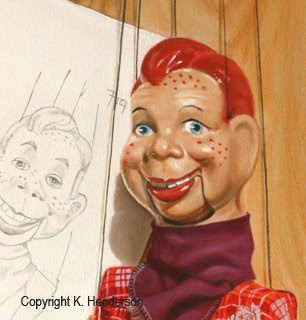 I painted a thin layer of white on the paper, covering the details on the paper. I will bring them out again later. 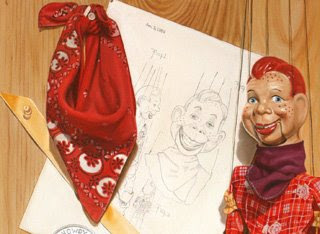 I added a purple glaze to Howdy's scarf, a red glaze to his shirt and a bluish glaze to the pants. His hands and feet are also glazed. My glazing is done by adding Liquin to my paint. You just need a small amount if you are using transparent colors and a bit more liquin with the semi transparant colors. Opaque colors can not be used as a true glaze. Tomorrow I will add the finishing touches. Ok. The painting is starting to come together. I put in the details of the wood background. The underpainting is complete and now I’m just glazing. I started my first red glaze on the scarf and the yellow glaze on the ribbon. I’ve started adding detail to the paper. As you can see, I jump around a bit. I get so excited about wanting to see what the painting is going to look like that I paint a little bit of every object. PS The Art show in Santa Fe was a HUGE success! Today I put a neutral gray layer on the background. The Raw sienna still shows through. 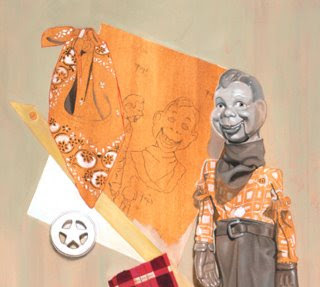 I also refined the badge, brightened the lower left corner of the paper (this is a copy of Howdy Doody’s patent), started defining the printing on the paper, added shadows and just started adding more details. I’ve had many people ask me how I create my paintings. I’ve decided its time to do a Show and Tell. 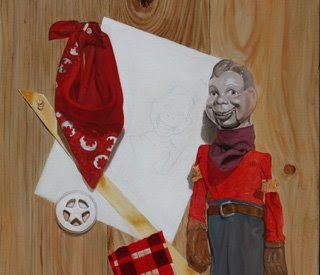 This is my painting The Making of a Cowboy. I start by setting up a still life and photographing it. 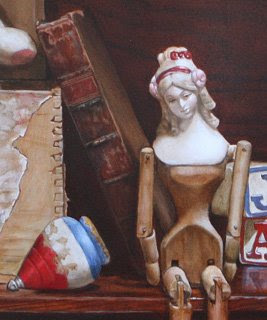 I use the photographs as well as the actual still life object to create my painting. 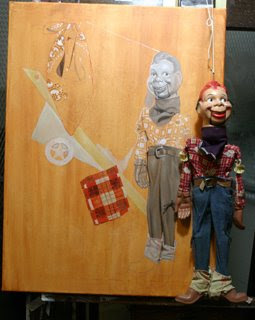 You can see my marionette hanging from my easel. I start by toning my background. In this painting I used a raw sienna. I then draw my still life on tracing paper and then transfer the drawing to my canvas when the toning layer has dried. I’ve Got the Blues is an oil painting on canvas, 20″ x 18″. It is another in my series of black and white striped paintings. 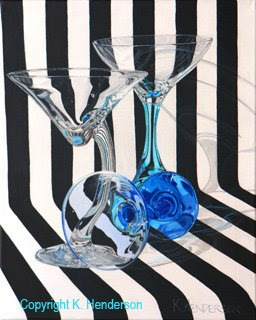 It shows three wine glasses against the striped background. I love the way the stripes show through the transparent glass. Remember when movies cost a dime and the cowboy serials were all the rage? Ok, neither do I. 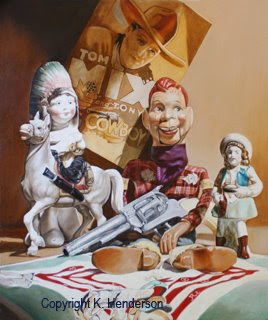 But this painting Saturday Matinee brings those time back with a Tom Mix poster, our favorite cowboy, Howdy Doody, a cowgirl sweetheart, American Indian, a horse and a six shooter. What more do you need?